It has been a good 4 months since I released the original Ultimate N5 deck. It has been getting some good responses and I have received a lot of feedback on its use. I took some of the good and threw away some of the bad to make the N4 deck more useful and more valuable to you. I never thought about background color that much when I am studying. I guess I didn’t see it as being that important, but a reader recently wrote in and suggested changing the background color to a greyscale. At first, I was a bit skeptical but it is actually a big help for the deck. First, it is a lot easier on your eyes. This might not seem all that important, but if you consider the amount of time you spend with your Anki deck, it really starts to factor into the equation. The lower contrast between the background and text is easier on your eyes for sure. Second, the reader that emailed in told me that this helps with memory retention. This makes sense because other sites like memrise.com use this same low contrast setup in their systems. So, I think it will help you focus more and retain more information easier. I’m still open to suggestions though. Do you think the contrast is too low? Too high? Distracting? I’d like to hear from you if you like or don’t like it. Another thing I didn’t put much consideration into before is fonts. This was, again, another fabulous reader that suggested that I use a more readable font. I’ve had to change the font in Windows because although Windows 7 comes packaged with a fabulous font (Meiryo), it isn’t turned on by default. The reason why is anyone’s guess. So, I modified the deck to use the Meiryo font by default. This should work for Windows Vista and 7 users out of the box. Windows XP users will have to download Japanese ClearType fonts. Mac OS 10 users can use the font Hiragino Maru Gothic ProN, which should come free with the OS. Fonts might seem like such a small little thing to tweak, but it does really improve the readability and usability of the deck. I think you’ll find it easier to read as well as help you to be able to recognize other Japanese fonts when you encounter them. Pay particularly close attention to the transitive (vt) and intransitive (vi) verbs. These often come up on the test in the usage or grammar sections, especially at the N4 level. Again, I’m making this data available under the Creative Commons Attribution-NonCommercial 3.0 License. This means that you can share or modify this collection of data, but you can not resell it, and you must attribute your work (with a link to https://jlptbootcamp.com). I’d also like to hear about what you’ve done to the deck, or any changes that you think would make it more useful. If you have any suggestions, don’t hesitate to contact me or you can of course, leave me a lovely comment below. P.S. Do you think the N4 deck is truly the ultimate deck? Me, too! Sign up for the newsletter! P.P.S. Do you think the N5 deck is bigger and badder then ever? Then try joining my Facebook Page for all the latest updates. Thanks for putting these decks together. I appreciate it. I hope to use this N5 deck along with my other studies to take the N5 test December 2012 in Toronto. I noticed that the N5 Deck has the grey background only in one direction. The other direction is still white. Was that on purpose? Oops, I’ll get that fixed ASAP. Sounds like I changed one card but not the other. Sorry about that. For people using Mac OSX, I highly recommend the Hiragino Maru Gothic ProN font for the “Kanji” field, it makes the deck more friendly… but then again, experiment by yourself and see what works for you. For windows, Meiryo is indeed a great font. One CANNOT underestimate the effect small tweaks like this can have on your overall SRS-ing experience. About the background colour, it depends on the individual but anywhere between 140/160 should yield the best results. 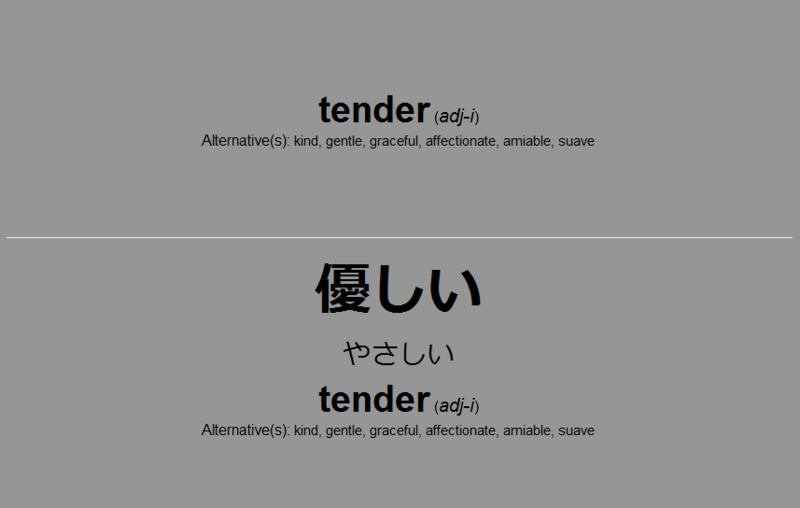 One more thing: when I started studying japanese many years ago, what really annoyed me were those adverbs. Learning them by heart is difficult. For such words, it is far better to put them in context (i.e. a short sentence) I like to add another field to the “Ultimate Layout” in which I input a quick sentence straight from a good unilingual dictionary. Of course this can also help tremendously for other confusing words. Also of note, it has been said that learning words on their own is useless, especially for a language that heavily relies on context to convey meaning. While I completely agree with such a view, one must not forget that everyone is different and you should do what feels the most comfortable for YOU. I am quite an analytic learner and really ENJOY learning everything there is to know about a word (i.e. its different spellings/kanji) and sentence/context based decks don’t really fit the bill when it comes to inputting detailed side notes. I’ve avoided example sentences with these decks mostly because I didn’t want to sort through a long list of sentences to find one that only had words from N5 in it. Or spend time writing my own. Maybe if I find some time I can go back and whip up a batch of good sentences. I think the whole learning words on their own argument is valid, but what I like to do is put all the words in my head, then go reading and put them in context. I find this to flow better than trying to read through a text and stopping and starting every time I encounter a new word. Studying words on their own is like throwing a dictionary into your head. It cuts out that sometimes demotivating troublesome step of looking up words. Thanks for all the advice Aryllies! Thanks so much for putting this together. You may have said this in the blog post (I just skimmed it), does the N4 deck include the N5 words or are they left out to cut down on fluff? Yeah, you guessed right. This deck only has words for the N4 level, the Ultimate N5 has N5 words. The deck will seem a little bulky because the cards are put in both ways Japanese->English and English->Japanese. Hi, thanks for making this great resource freely available. I used your N5 deck as my primary vocab review tool for the JLPT N5, and it worked great so now I’m moving onto the N4. Great! Good luck with the tests! First of all thank you very much for all your effort! It’s amazing what you created here! I have a questions regarding your N4 deck. Why did you include even higher level kanji for studying? Isn’t that too difficult to study the words then? I know that the first kanji of 心配 is included in the Kanji list for the N4 but the other kanji is not, right? Also the kanji for 優しい is not included even though the word is even a JLPT N5?? word. So do you think its beneficial to study these words in that way? if just 優しい appears at the front and you never saw that kanji before can you really memorize it then? did you make good experiences with that? Thank you and I’m looking forward to hearing from you! so, first off, the deck is designed to show the words how they appear in ‘natural’ Japanese, ie. out in the wild, the deck completely ignores which kanji belong to which level. 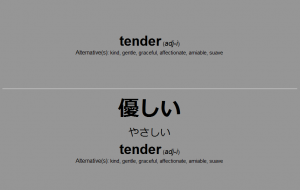 The reason for this is two-fold really, first, most people want to learn a word how it naturally appears so they can use it right away and not re-learn it when they encounter the kanji. Second, it would be an editing nightmare to go through and individually check every kanji and see if it was the correct level or not and with the limited time and resources I have I took a pass on that. Also, the kanji for 優しい should be included, I checked the master list and it was on that. Let me know if something got edited wrong somewhere. You are using the Anki version of it right? For the test, outside of the kanji section, there will be furigana above N4 kanji and all words that use N3 and above kanji should be written in hiragana only. N5 kanji are assumed to be known and do not include any furigana. I hope that all helps. I appreciate the hard work it took to make this Anki deck, but I don’t think we can use it for N4 study. I agree with Alex that the deck should not include kanji that is beyond the N4 level. It would take a lot of work to rectify. I wonder if someone couldn’t solve the problem with some programming? Maybe, I’m not sure if that data exists, but I guess it is possible. You’re welcome to give it a try. It’s released under Creative Commons, so you can play around with it. I’d be happy to post any changes you make. Is there an N3 version? Not yet, unfortunately. I’ve been building up resources for N5 and N4 recently. Also, the N3 list is more up for debate so to speak. There are some pretty accurate guesses, but nothing definite since it didn’t exist before the new round of tests. Thanks for your swift response, Clayton. I am currently assembling an N3 deck. I have most of the “front” Japanese sides prepared, but how did you get Anki to double the cards up to test front and back sides? um, I think there is an option to do it when you import the cards, right? You can set a layout and make forward and reverse cards. If you’d like I can package up a list if you have it in CSV. I have the ultimate layout (with the gray background and font settings) saved so it should be easy if you have the proper columns. Actually, I imported your template today. It is working great. I dunno why I didn’t think about doing that before. The only thing I am adding to the template is furigana. Just studying for the test is probably not enough. You will have to do some outside practice, especially with speaking and general conversation skills. There are some people that have passed the higher levels of the test, but struggle a bit to keep a conversation going, so you have to be a little careful to keep a balance. A good rule of thumb is to learn things for the JLPT, but then make sure to use them in real life as much as possible. The real life experience in turn will fill in your understanding so that you can get a full picture of how to use the language effectively. Yeah it does make sense. How do you suggest making use of it in real life in mid N4 level? I can’t hold a proper conversation yet . Nor does my timezone allow speaking with japanese online, so it’s a little problematic. N4 grammar is about all you need to have a conversation. At least daily conversation, nothing too deep. All you need is some vocab. And yes it is hard at first (like starting reading at first) but you slowly get used to it and eventually you get the swing of it. Also, its fairly easy to find a native with a small amount of English skill. Some will volunteer their time because they want to be Japanese teachers. As for time difference, again you might be surprised. There are a few bored housewives I’m sure that would love chat and have an open schedule. You might have to be a little flexible yourself though. I know verbling.com did have a chat roulette style of language chat you could try. But there also some other services out there. My god, you’re helpful. Bored housewifes, huh?Like the sound of that. Thanks for the help! Really thankful for your responsiveness.